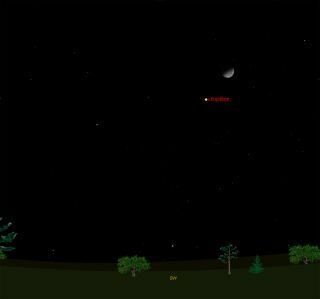 This sky map shows a view of the southwestern sky at 9 p.m. EST on Dec. 13, 2010. Jupiter will appear close to the moon, and just to the lower left. The Geminid meteor shower also peaks overnight this evening. Tonightmay be the big night for this year's annual Geminid meteorshower, but early in the evening the moon and Jupiter should put on aneye-catching display of their own. TheGeminidmeteor shower occurs every year and should begoing strong by 12:30a.m. local time tomorrow (Dec. 14). Jupiter and the moon are the cosmicopeningact for the Geminids, which are typically the best meteor shower of theyear. Thissky mapshows where to look in the southwesternsky to see Jupiter just below the moon tonight for observers with goodweatherand clear skies. Jupiterand the moon will be separated by about 7 degrees of arcin the night sky. Keep in mind that your clenched fist held at arm'slengthmeasures about 10 degrees. So Jupiter and the moon should appear lessthanthree-quarters of a fist apart. Themoon, of course, has always been a prime target for telescopeobservers everywhere and shows amazing detail in even the smallesttelescope. Even binoculars will show the mare or "seas,"mountainranges, and ringed plains, as well as the great craters, while with atelescopeof only 3-inch aperture you can see practically everything as clear asthe verybest Earth-based photos. Mostobservers agree that the very best time to view the moon isnow ? right at the time of first quarter and in the few nightsthereafter.Currently the moon is in a good position for evening study with most ofitsmajor features visible, while not overly bright (as is the case at fullphase)to cause a loss of detail through glare. Thebest views are along the sharp sunrise line separatingdarkness from light, called the terminator. Through a telescope,features nearthe terminator stand out in bold relief; shadows are strong and detailsaremore easily seen. Sometimes you can even notice bright specks of lightwherehigh mountains catch the light of the rising Sun before it has reachedtheplains below. Whileyou're looking at the moon early tonight, you'll immediatelytake note of the brilliant silvery "star" shining almost directlybelow it. That'sthe largest planet in our solar system: the planetJupiter. As darkness falls, you'll see thisbright pair standing duesouth, about halfway up in the sky. Assoon as it gets dark, those using telescopes will have Jupiter manifestits profuse embellishment of atmospheric details. A medium-sizetelescope mayshow you literally dozens of features in the restless atmosphere ofthisfastest spinning of worlds. Andeven in steadily-held seven-power binoculars, you can glimpsethe four big Galilean satellites, which will appear as tiny starsimmediatelyadjacent to Jupiter. Infact, if you look tonight, you'll see all four stretchedoutward on one side of the planet in this order: Europa, Io, CallistoandGanymede. And Jupiter itself will remain in view until it sets aroundmidnight. Ifthe cold doesn't drive you inside after Jupiter sets, theGeminid meteor shower should be getting into full swing at that time. TheGeminids will peak at about 6 a.m. EST (3 a.m. PST and 1100GMT). And if Jupiter, the moon and a meteor showeraren't enough foryou, you can stay up past sunrise and try to spot the bright planet Venusin the daytime sky.